We've been quiet for a while but are letting the news out. Presentations is nearing our first birthday, and we're unveiling a slew of new features that will make your presentations pop. To start off the announcement... reveals! You can set the order that objects appear. Or, setup a textbox to reveal paragraphs or bullets one at a time as you're giving a presentation. Reveals are perfect for pacing your talk, keeping the audience focused on you rather than reading the slide content, and constructing neat visual sequences. Set the order that an object appears by right-clicking on it and selecting "Incremental Reveal". If you'd like to see reveals in action, check out this presentation. You'll also notice a complete face lift of our user interface. Now that we're growning up, we wanted to give you more space to edit your slides and still allow you to get to the right features to create your slides. With this new design you'll see a significant increase in slide space, improving the experience on smaller laptop screens. Another oft-wished-for feature is Zoom. Just go to the Slide>Zoom menu to zoom in or out, letting you work on slide details to your heart's content. 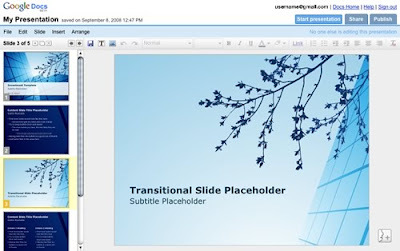 Finally, for all you Ctrl+Z fanatics out there, full undo/redo is now available in presentations. Never say "doh" again, undo is there to save the day. With that, we invite you to give these new presentation features a try. 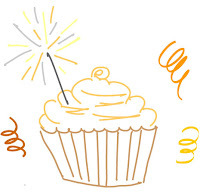 We're excited to be turning 1 and look forward to another jam-packed year!